Enjoy Gold Coast views from the air aboard a scenic helicopter flight and from the water aboard an exhilarating jet boat ride on Gold Coast's famous Broadwater waterways. But the fun doesn’t stop after 55-minutes! You’ll next arrive at the Gold Coast Sheraton Mirage Heliport for an adrenaline-packed 10-minute scenic helicopter flight. Take in panoramic views of the Gold Coast as you fly over Royal Pines, Jupiters Casino, Q1 and Broadbeach before turning north along the foreshores of Surfers Paradise, Main Beach, Seaworld and South Stradbroke Island before returning to the Gold Coast Sheraton Mirage Heliport. 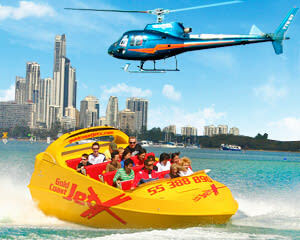 This extreme jet boat and helicopter adventure is not to be missed! There is a minimum number of 2 paying adults required for the Helicopter ride to go ahead. Please note that if you are travelling alone you may be grouped with other paying customers and the start time of your helicopter flight may be be subject to change. Weather may affect the start time of this experience. Your 1.5 hour extreme adventure operates from 10:30 AM to 4:00 PM during October to February and 12:00 PM to 3:00 PM during March to September. The tour operator is open seven days a week all year round except Christmas Day. Please note: the heliport which you land in after your flight is a 5 minute taxi ride or a 30 minute walk away from the departure point. Adrenalin is a great gift as there is plenty of choice. What great day for my son and I but you need to have a teenager rate as well because teenagers are not adults! The whole experience for our family was awesome, thankyou for a fantastic time!! Both the Jet Boat and Helicopter experiences were amazing. Heaps of fun as well as a great way to see the Coast. The walk back was a liottle more the 30 mins as advised by the team. To have transfers back to the car would have made the experience even better. Very well organised. Friendly, bubbly and confident service.